The jet skid off the runway at Dayton International Airport in Ohio. 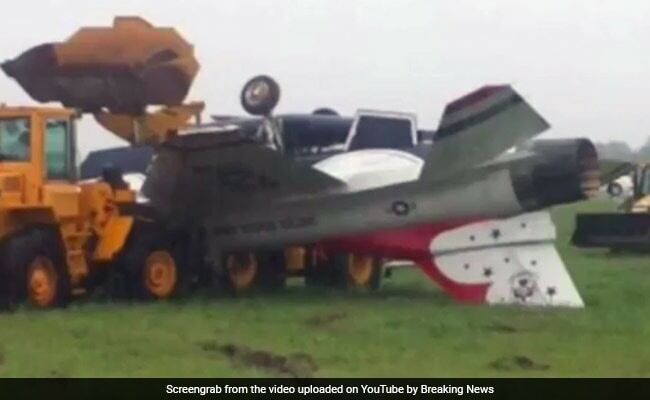 While landing at a rain-soaked airport in Dayton, Ohio, on Friday, an Air Force fighter jet skidded off the runway and flipped upside down, trapping two men inside for more than an hour. A pilot took the F-16D Fighting Falcon out from Dayton International Airport in the morning to prepare for an air show this weekend, the commander of the Air Force Thunderbirds told reporters. The airport got a record-breaking amount of rain that day, according to the Dayton Daily News, but the Air Force said the weather had been deemed safe to fly in. And sure enough, nothing happened to the F-16 while it was in the air. Even the landing - shortly after noon in wind and rain - looked smooth to one witness. "I looked up and I said, 'Man, he's going really fast,'" the man told WHIO 7. "He was almost hydroplaning." Lt. Col. Jason Heard, who leads the Air Force's aerial acrobatics team, said the jet skidded about 300 feet off the end of the runway, and that he could not recall another incident quite like it in the Thunderbirds' 64-year history. The pilot, Capt. Erik Gonsalves, had more than 1,600 flight hours, as well as combat experience, Heard said. He had been taking Tech. Sgt. Kenneth Cordova out for a sort of practice flight before Saturday's show. Though they weren't badly hurt, an airport official said both men were stuck inside the overturned jet for "an inordinate amount of time." "It was complicated," Dayton aviation director Terry Slaybaugh told reporters, describing how emergency crews and airport officials took about two hours to extract the men from a military jet "we're not familiar with." Heard said both men were conscious the whole time, and they even helped direct emergency crews in the rescue. The captain was hospitalized with cuts and a leg injury, while the tech sergeant had no apparent injuries, and both men are expected to be fine. While it has not offered any explanation for how Gonsalves crashed, the Air Force plans to eventually release a report on its investigation. "We have a very, very good safety record," Heard said, though he acknowledged this was not the first crash in Thunderbirds history. It was just over a year ago, in fact, that a Thunderbirds F-16 crashed after flying over an Air Force Academy graduation ceremony with President Barack Obama in attendance - on the same day that a Navy Blue Angels pilot was killed in yet another air show incident in another state. Air show pilots, as Thomas Gibbons-Neff wrote for The Washington Post, are typically among the best in the military. And fatal accidents are rare, according to an analysis by the Chicago Tribune in 2015 - after an Army skydiver was killed in a performance. Excepting a catastrophic plane vs. crowd incident in Reno, Nev., that killed 11 people in 2011, the newspaper reported, most years see between one and three deaths. Gonsalves was in his first season with the Thunderbirds, according to the Dayton Daily News, and was an advance pilot and narrator for the show. He would not have actually flown in Saturday's performance in Dayton - which, due to the crash, will now take place without the Thunderbirds' climactic flyover.